When life makes you stressed and scattered, put away the smartphone, pick up some colored crayons or markers, put in your CD – and quiet your mind and soul. With this coloring book for grown-ups you can create something beautiful, and reconnect with the spiritual side of things while listening the comforting harmonies of the psalms. Color and listen anywhere – at home, in a church, on a park bench, on a road trip – whenever you need to take a break and slow down. 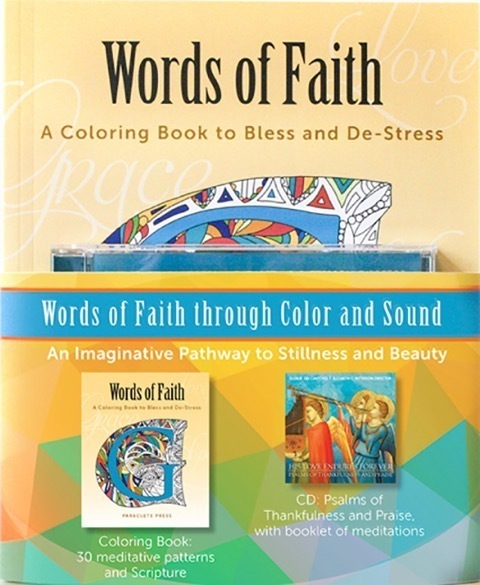 Whether you are spiritual or religious, connect with your creative side and embrace beauty as you color these 30 designs, listening to beautiful, comforting harmonies, with each design paired with an uplifting Word of Faith and a simple verse. "A terrific recommendation from Paraclete Press [and a] treasure that will truly amplify joy." "I trust this video gives you a little peek at what this set is all about. The CD contains 20 tracks of choral music—all based on the Psalms. The audio in the video contains excerpts from 2 tracks. As the back cover says, "...Put away the smartphone, pick up some colored crayons, markers, or pencils—and quiet your mind and soul." Each 2-page topic has a scripture reference, and corresponding artwork, which resembles a stain-glass window. For example, the "Wisdom" section has a full-page diagram to color, with a large, fancy "W" in the middle. My favorite is the chapter on Love, I Cor 13. A delightful idea. Beautiful booklet and inspiring song. You will be blessed—I was. We are called to be light in the darkness, salt for the earth… and color on the blank page! So I actually sat still for long enough to color an entire page in this book! And I’ll tell you this – I’m planning on doing that again very soon. Paraclete Press has pieced together this package of Color & Sound. It includes Words of Faith: A Coloring Book to Bless & De-Stress, and a gorgeous CD, His Love Endures Forever: Psalms of Thankfulness & Praise. If you’ve never heard of the Gloriae Dei Cantores choir, they’re amazing. Their music is truly a little glimpse of the gorgeous music that awaits us in Heaven! The coloring pages found in this set are intricate and beautiful. When you decide to splash a certain color onto a portion of the page, it’s almost impossible to view all ramifications of this at once. The spaces to color wind and twist and connect in unexpected ways – and through this you lose a sense of control over the finished product. Isn’t this a profound thing to realize as you are coloring? That we don’t have control over the finished product? And that’s just it – you’re not just coloring. You’re praying through a creative and freeing medium – color on paper. The spaces to color wind and twist and connect in unexpected ways – and through this you lose a sense of control over the finished product. Isn’t this a profound thing to realize as you are coloring? That we don’t have control over the finished product? And that’s just it – you’re not just coloring. You’re praying through a creative and freeing medium – color on paper. This gift set engages your senses and focuses them on Scripture. You will hear Scripture sung by an outstanding choir, you will see Scripture written out on the coloring book, you will hold a coloring utensil of your choice and create lovely art. You may choose to say the written Scripture verses aloud to help you commit them to memory as you color. The pamphlet that accompanies the CD also contains a treasure trove of little meditations – each one a gem that brings you deeper into the mysteries of each Psalm sung. Use a coloring utensil of your choice! My preference was “Crayola Twistables.” Originally purchased to help me take notes in fun colors during pharmacy school, they’ve lasted for years, and are now used by our children… and for my coloring prayers! ◾a teen on a long car trip – bonus: parents get to enjoy the music on the car ride! ◾… and so many others!